Today, we visited Sabatino’s Artisanal Market to get some organic peanut butter, vegan fudge, bread and other stuff. Then we stumbled upon a music festival at Otorongo Plaza celebrating 80 year anniversary of a local music conservatory. 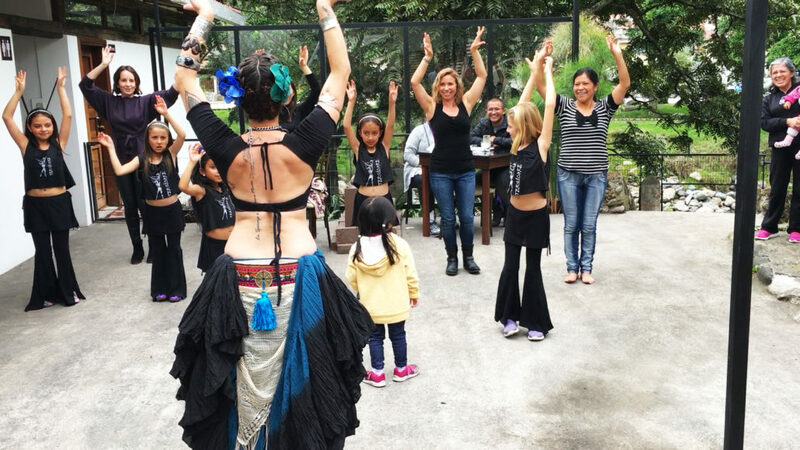 Then we went to Fratello Vegan for a delicious lunch and belly dancing performed by Academia Profesional de Danza Clásica “Tersícore”. 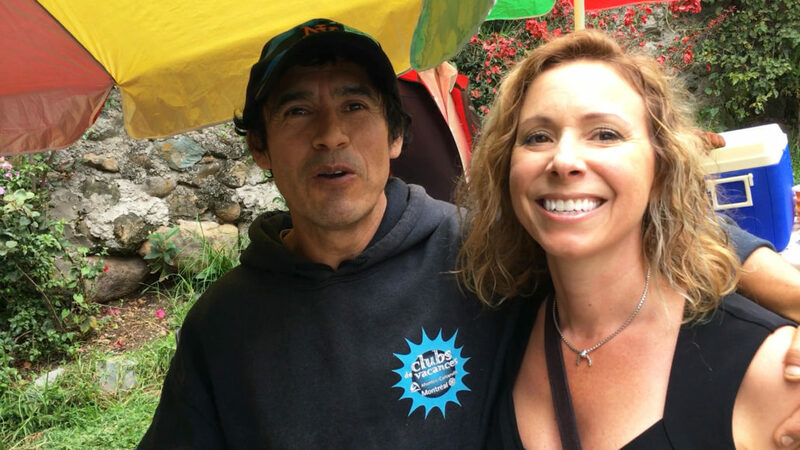 We hope you enjoy seeing the beautiful organic food, scenery and people of Cuenca, Ecuador. We’ve also included some Spanish language learning opportunities for you. American pop culture is very, well, popular here. 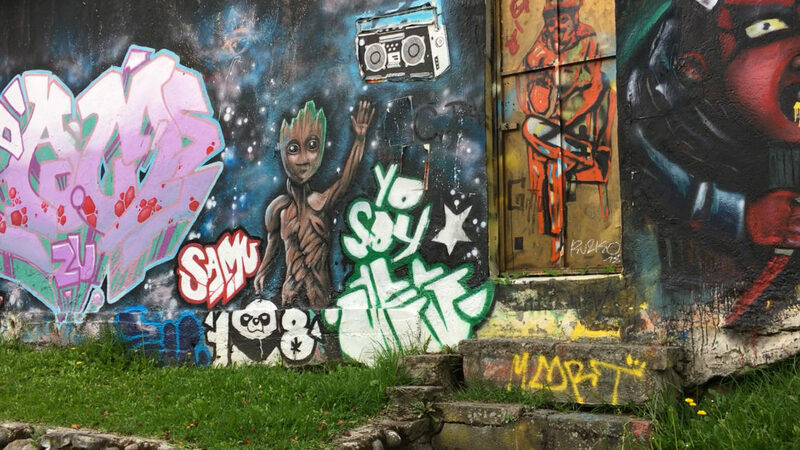 American TV commercials, movies, music, billboards, fast food restaurants and even graffiti art can be found everywhere, just like this tribute to the loveable Guardians of the Galaxy character, Groot. Even Yoda and Darth Maul can be found brandishing their infamous lightsabers. Graffiti is a prevalent blemish on an otherwise clean city. In an effort to cover some of it, graffiti artists (probably the same ones responsible for the unsanctioned graffiti) are hired to paint large murals like this one. Most of these murals have remained untagged so it appears to be an effective deterrent. 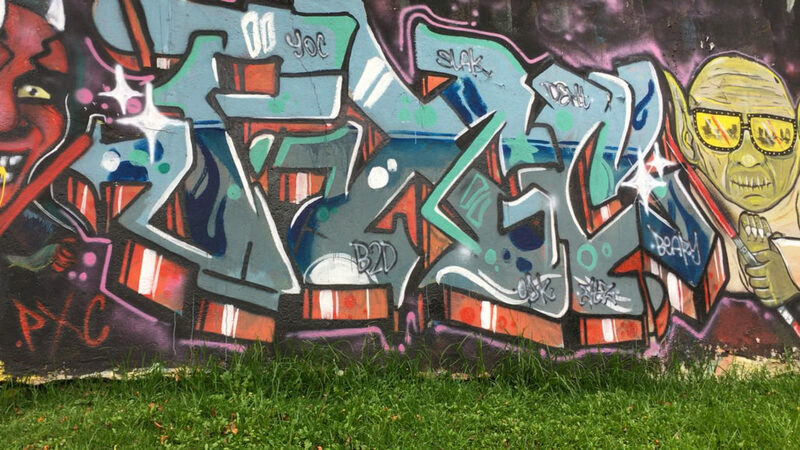 However, if they really want to curtail the non-artistic graffiti, they need a national registry for spray paint, and a minimum age to buy it. The Tomebamba riverwalk in Cuenca, Ecuador is one of the most beautiful cobblestone paths on the planet. It’s lush and green, and lined with flowering trees and bushes. It follows the Tomebamba river from Otorongo Plaza on the west side of El Centro to Parque Paraiso on the east side. There are also several restaurants along the path with amazing views of the river and patios that are perfect for people watching. Bike lanes are being added all over to make the city more bicycle friendly. They want to encourage more people to ride their bikes to work and school. The main reason for this initiative is to reduce the increasing traffic congestion and pollution, but also to improve people’s health. Like most developing countries, Ecuador is seeing a rise in diet and exercise related health problems as people transition away from their traditional starchy fruit, vegetable and whole grain diets with minimal meat, to the western diet that’s high in processed foods, fast foods, sugar, salt and animal products. It’s additionally distressing to hear unhealthy gringos doling out nutrition advice. Ecuadorians are being told to eat less of their traditional low-fat, starchy diets that have kept them lean for millenium. Instead, they’re being told to replace their traditional foods with more meat, dairy and eggs…the very foods (along with processed foods) that have already created a health epidemic in western developed countries. The “diseases of affluence” like obesity, heart disease, diabetes, stroke, etc., are largely due to the increase in saturated fats and calories from animal products, combined with a more sedentary lifestyle. The best advice we gringos could give the Ecuadorians is to ignore the western nutrition advice and go back to the way they used to eat. Oh, and put down the smartphone and go for a walk. Magnolia Café in Otorongo Plaza (Plaza del Otorongo, en español) on the east side of El Centro has a descent veggie burger, delicious papas fritas (French fries) and reasonably priced Club Verdes. They also have a really nice covered patio with a good view of Otorongo Plaza that’s perfect for people watching. Be sure to ask for your papas fritas “sin mayonesa,” which means “without mayonnaise.” Most of the restaurants that we’ve been to in Ecuador serve papas fritas with mayonnaise instead of ketchup, and it’s usually served in little bowls so it gets thrown out if you don’t eat it. Ketchup is called “salsa de tomate” and mustard is called “mostaza” so ask for that instead. Sabatino’s artisanal popup market occurs on the first Saturday of the month and it’s at Tutto Matto on Ave. Solano on the third Saturday of the month. You can keep track of the popup markets on GringoPost. These popup markets aren’t vegan, but they do have lots of vegan options, like bread from ArteSana and organic peanut butter and vegan fudge from Franco Orgánico. 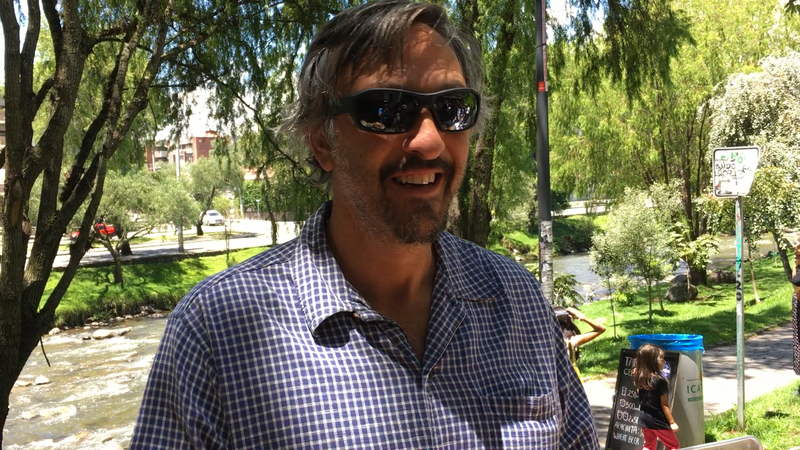 One of our favorite vendors at Cuenca’s artisanal popup markets is Franco Orgánico. He sells the most delicious natural organic peanut butter, vegan fudge, sweet potatoes, vegan crackers, coffee, squash and other things. He’s fluent in English and loves to tell us about his foods. 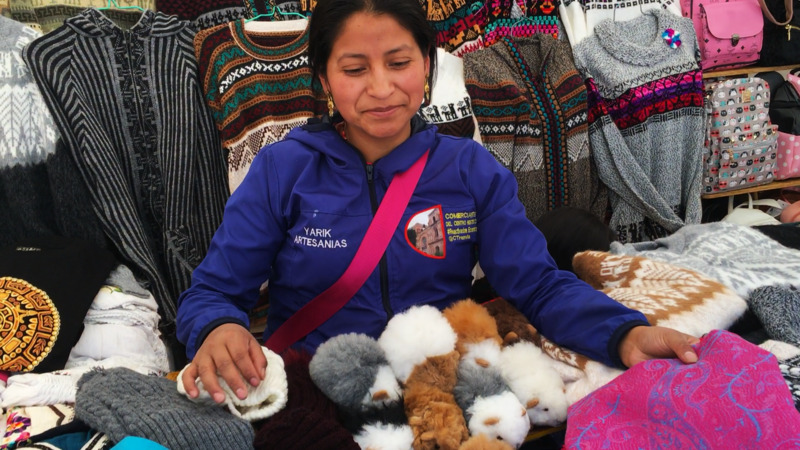 He also sells in Loja and Vilcabamba in southern Ecuador. 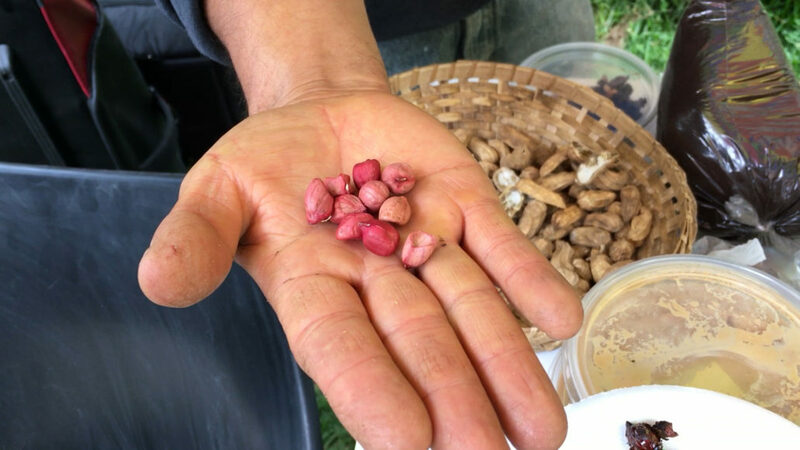 Franco’s peanuts come from an ancient species of peanut that look and taste different than what we’re used to in the states. They have a different shape, they’re softer and they have a milder flavor. He makes his peanut butter by grinding the peanuts without any other ingredients. No preservatives, oil or other mystery chemicals. It’s all natural and delicious! 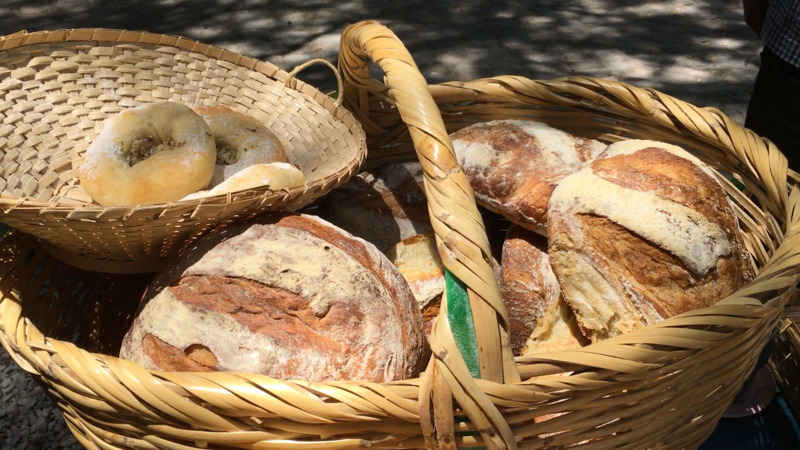 Our favorite bread vender at Cuenca’s popup markets is ArteSana Panadería y Pastelería (bakery and cake shop). Not all of their products are vegan, so be sure to ask. But most of their bread is vegan, like their delicious sourdough bread and chia seed loaves. Tell Kelvert JP and Amelia sent you! As we were leaving Sabatino’s, this single parade float was passing by so we followed it to Otorongo Plaza. Ecuador has over 500 holidays a year, so it’s common to see small parades and festivals on the weekends, as well as during the week. 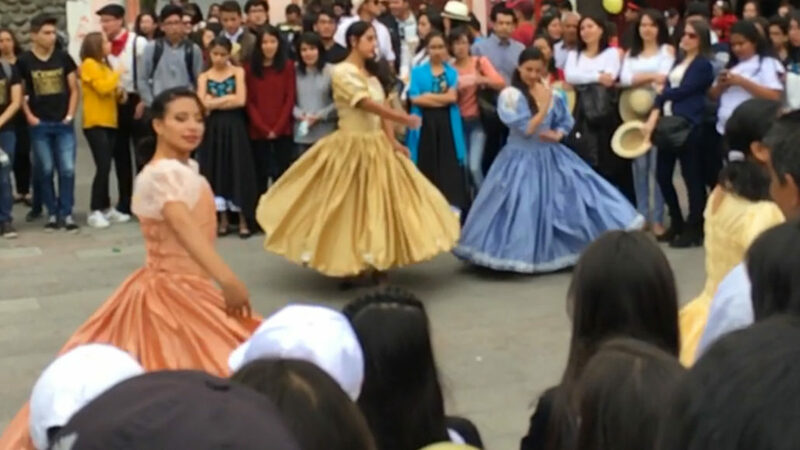 The music festival at Otorongo Plaza was celebrating the 80th birthday of the Conservatorio José María Rodríguez here in Cuenca. 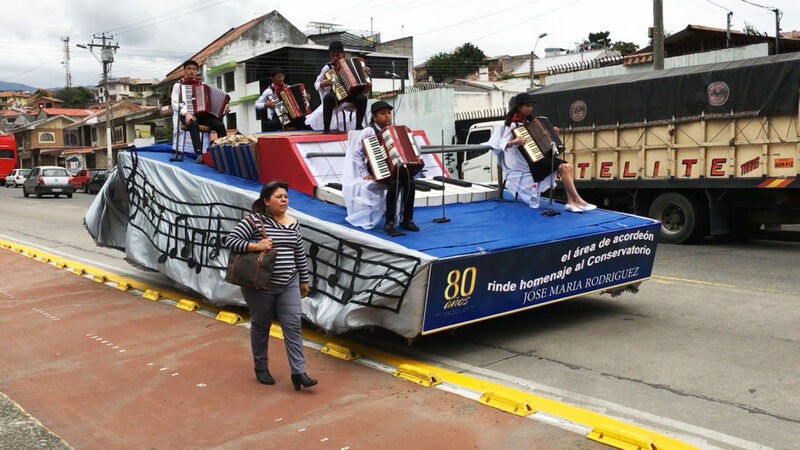 The sign on the float reads: 80 years – The accordion area pays homage to the conservatory. Accordions are a popular instrument in Ecuador, and you’ll often see them being played on street corners for tips (propinas). These are teenagers playing them on the float. We’re pretty sure this float was part of a larger parade up the hill from Otorongo Plaza in El Centro because a lot of people and marching musicians came down the stairs while we were watching. 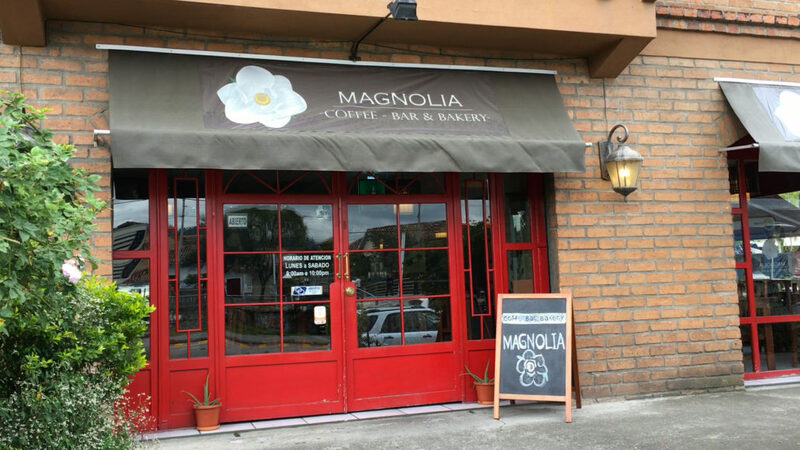 We decided to grab a seat on the patio of Magnolia Café to watch the festivities and enjoy una taza de café Americano (a cup of Americano coffee). After we left the music festival, we walked across the river to Fratello, but it had started to mist and the temperature had dropped so we went home first to get some warmer clothes. We normally walk everywhere, averaging more than 5 miles per weekday and 10 miles on the weekend. But to save time, we took a taxi back to Fratello, which is about 1.5 miles from our house. Taxis are very affordable here. As you can see from the little yellow and green meter on the dashboard, we were almost to Fratello and it only cost $1.37. It was less than $2 with tip for a 10 minute cab ride. We’ve been told it’s common to tip 10 to 25 cents, but we usually round up to the nearest cincuenta centavos (50 cents). We also like to practice our Spanish with the cab drivers. It’s a good use of time and they usually like talking about their city and lives in Cuenca. Don’t be surprised if they ask you personal questions, like how much money you make, if you’re married, have kids, how many kids or why you don’t have any kids. Children are a central part of the Latin culture and it’s common for Ecuadorian couples to have 3 or more kids, so a lot of the conversation revolves around children. 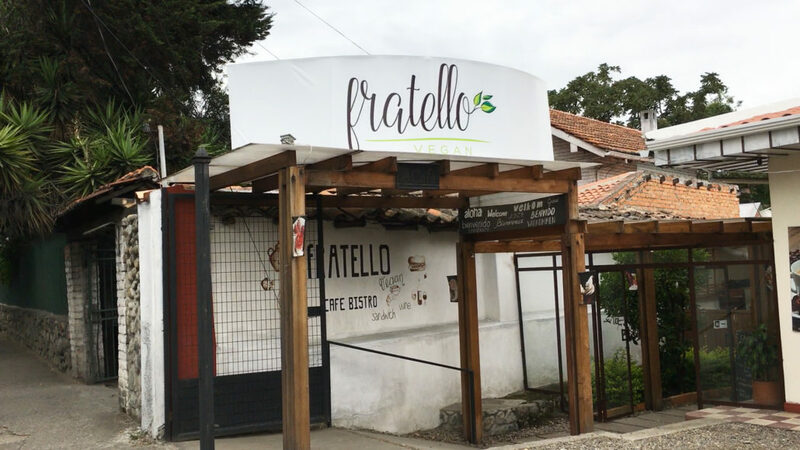 Fratello Vegan is one of our favorite restaurants in Cuenca. They have delicious vegan comfort food, like pizza, burritos, empanadas and ice cream. It’s a little off the beaten path, so you probably won’t stumble upon it by accident. However, it has a beautiful view of the Tomebamba River from its outdoor patio. While the patio area is covered and they have heaters, it can get a little chilly there on an overcast or rainy day, so be sure to dress in layers and take a jacket. 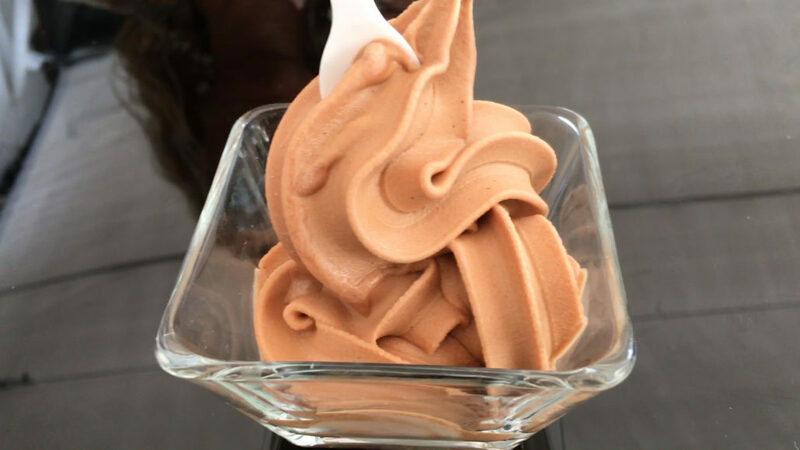 Helado (ice cream) is extremely popular in Ecuador. 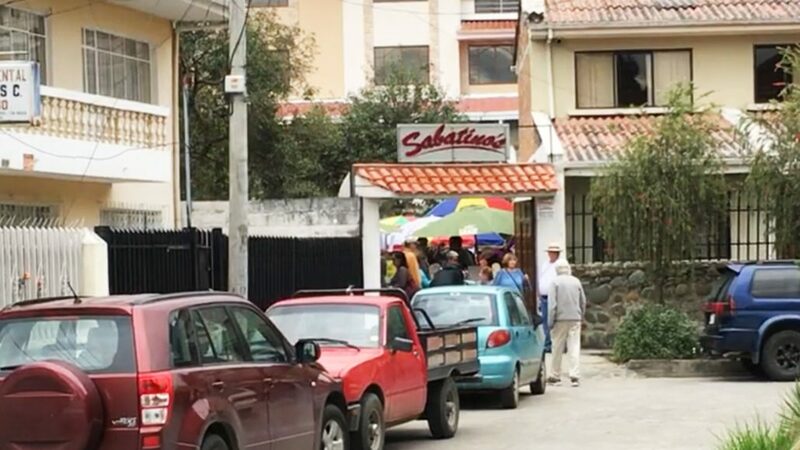 You’ll often see lots of people walking down the street eating an ice cream cone, and it seems like every street has una heladería (an ice cream shop). However, while most heladerías have at least one vegan option, Fratello is the only fully vegan heladería in Cuenca. And they make the most amazing vegan ice cream! I had the chocolate mint ice cream and it tasted just like a peppermint patty. Amelia had the wine ice cream and it was delicious, too. Fratello also hosts a variety of cultural, health and vegan related events. 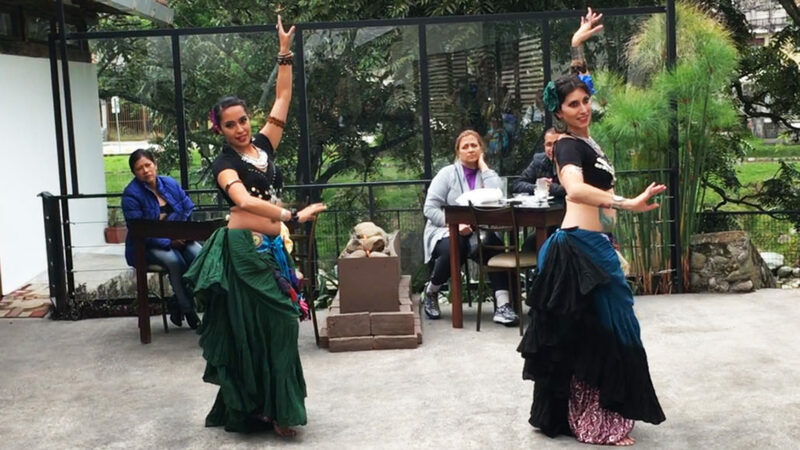 Today, we were treated to a belly dancing performance by Academia Profesional de Danza Clásica “Tersícore”. The woman on the right is the instructor, Caterina, who teaches classes in the ATS style of belly dancing. Amelia is taking belly dancing classes from Julio at The Tribal Fusion House, a different instructor who is part of the Tribal Fusion style of belly dancing. I’m not qualified to discuss the differences, but both look fun and beautiful to me. After the kids and professionals performed, Caterina taught a class and Amelia was very excited to participate in it. It’s the first time I’ve seen Amelia belly dance and I was really impressed, especially since she’s only been taking lessons for a short time. You can watch the full video below. And she’s almost 50 years old! 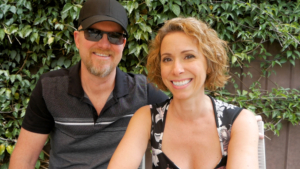 After 2 years of eating a plant-based, vegan diet, she has really rolled back time! 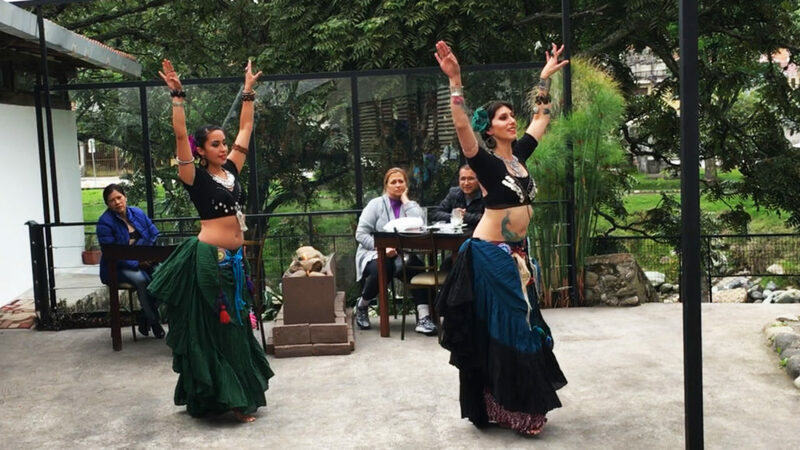 We hope you enjoyed our adventure to Sabatino’s Artisanal Market, the Music Festival at Otorongo Plaza and Belly Dancing at Fratello Vegan in Cuenca, Ecuador today. Please remember to like, comment and share our video, and also subscribe to our YouTube channel. If you’d like us to make a video about something specific or if you have questions, please let us know in the comments. ¿Cómo se dice? – How do you say? Está a la derecha un poco más lejos. – It’s on the right a little further. ¿Sabe Fratello? – Do you know Fratello? ¿Cómo está la empanada? – How is the empanada? 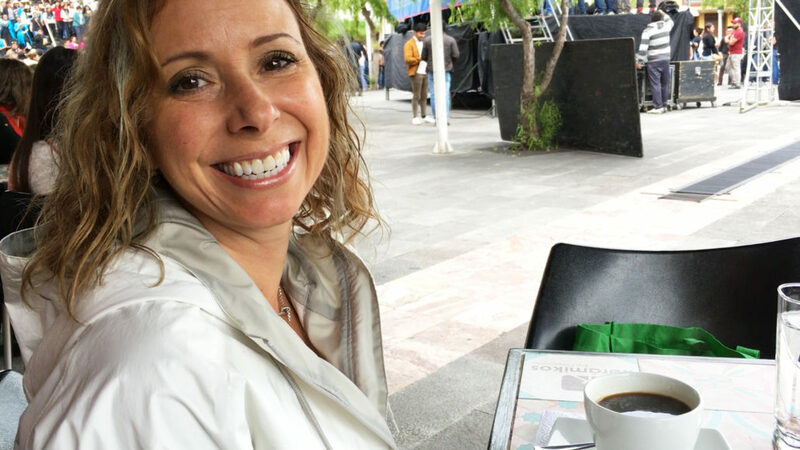 Today, we went to the artisanal Bumba Popup Market in Cuenca Ecuador before venturing onward to a popup outdoor textiles market and then to lunch at plant-based/vegan Café Libre restaurant. 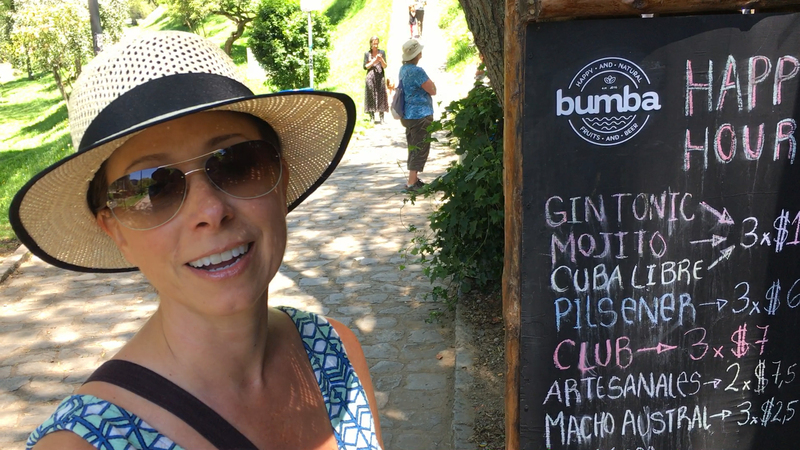 We love to visit the artisanal markets like the Bumba Popup Market for fresh, organic, delicious, locally sourced vegan foods. We hope you enjoy the amazing scenery and interesting people we meet along the way. We’ve also included some Spanish language learning opportunities for you. In this photo, Amelia and I are playing Frogger at a busy intersection in Cuenca near the fútbol (soccer) stadium, Estadio Alejandro Serrano Aguilar, where the Club Deportivo Cuenca plays (that’s Cuenca’s local fútbol team). 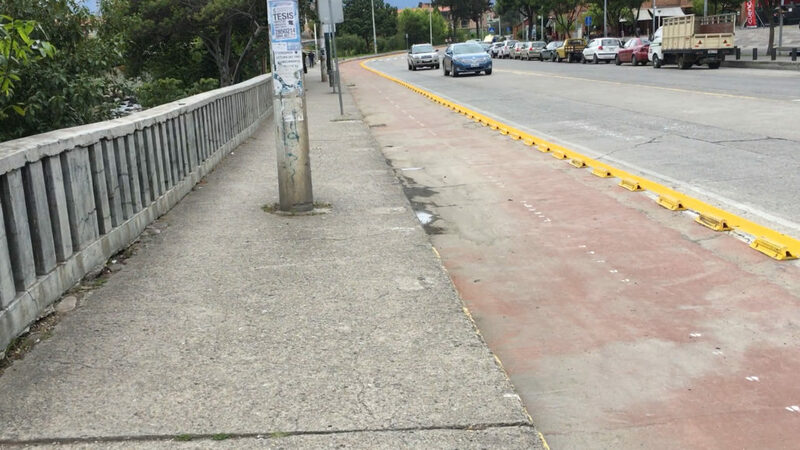 In Ecuador, pedestrians do NOT have the right of way. The pecking order from top to bottom is Busses, Taxis, Cars/Trucks, Motorcycles, Dogs and then Humans. Drivers don’t stop for pedestrians. In fact, we’ve noticed a lot of drivers speed up when pedestrians are trying to cross the street. 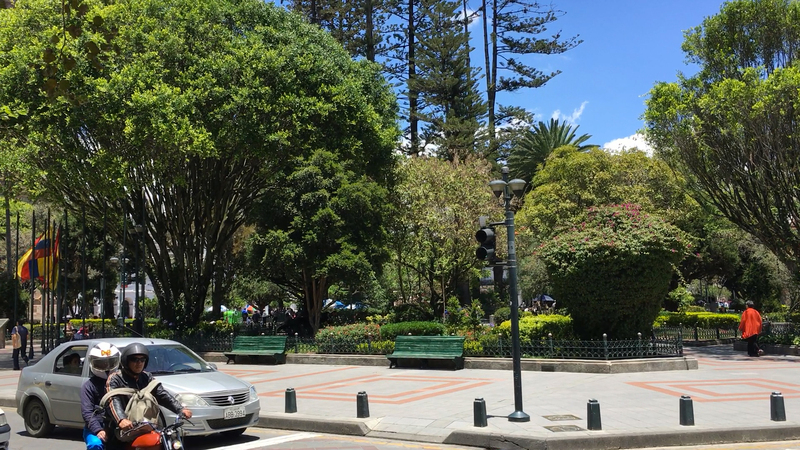 It seems very odd to us since everyone is a pedestrian at some point in this highly walkable city, and the Ecuadorian people are very tranquilo (calm and nice)…unless they’re driving. 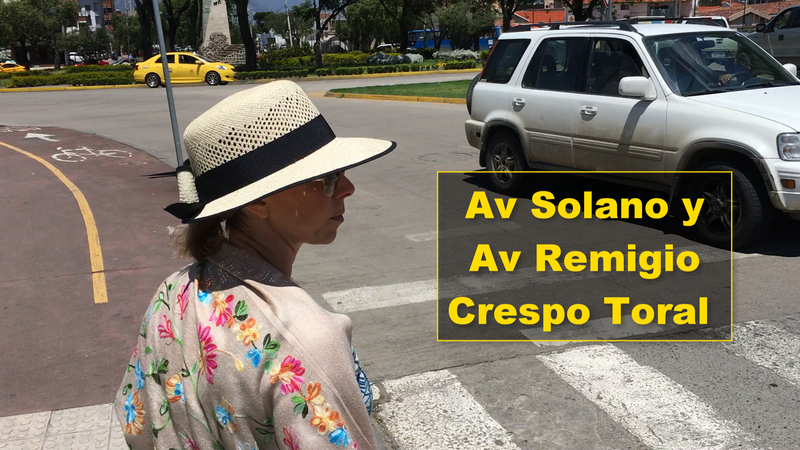 We have seen a few elder Ecuadorians step out into traffic with their arm outstretched in a “stop” gesture and cars come to a screeching halt for them, but I’m not sure that works for young people or gringos. Amelia and I have been too scared to try it. Having grown up in the fast-paced United States, Amelia and I are fast walkers (like a lot of the gringos who live here). 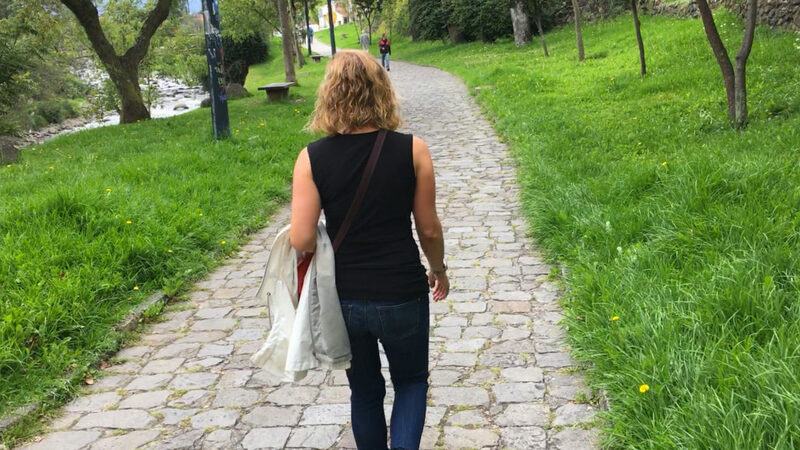 However, unlike us gringos, Ecuadorians are very tranquilo when walking so it’s common for us to experience mild irritation when walking behind people who are strolling on Monday morning like it’s Sunday afternoon. But when they’re behind the wheel of a car, normal tranquilo Ecuadorians turn into NYC taxi cab drivers with only two speeds: stop and fast. Please, be careful when crossing the street. Colegio Benigno Malo is beautiful high school in Cuenca, Ecuador. It has a French neoclassical architecture and was built in 1923. Students in most of Ecuador’s schools wear uniforms and this one is no different. On most days, the students wear navy blue slacks and a white polo shirt, but on some days, they dress up in skirts and sport coats. Bumba Fruits & Beer is a popular Ecuadorian hangout with a great view of the Tomebamba river. 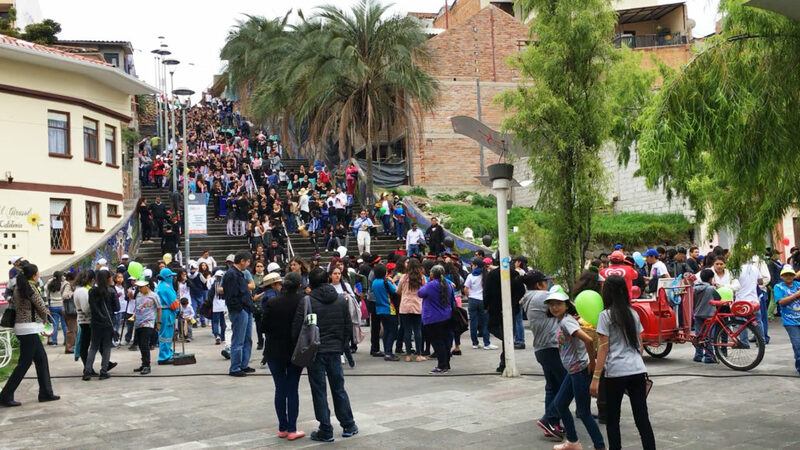 The Bumba Popup Market is also a big hit with gringos and Ecuadorians alike. Follow Bumba’s Facebook page and keep an eye out on GringoPost for the Bumba Popup Market dates and times. 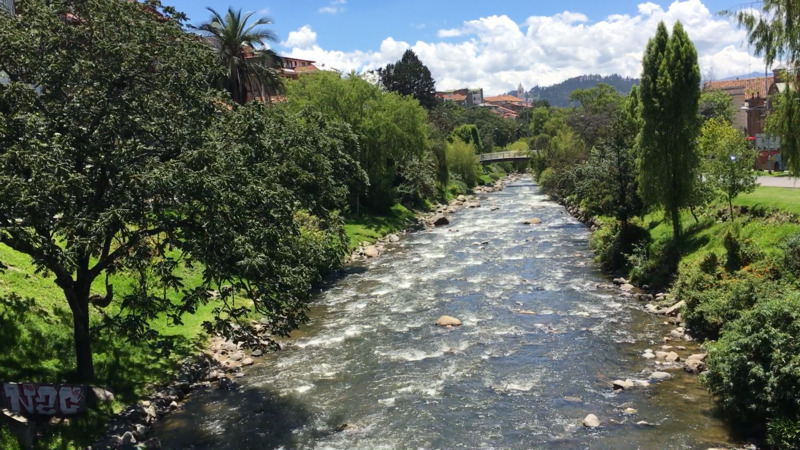 This is one of the main rivers that runs through Cuenca on the edge of El Centro (the center). It divides the old city and the new(er) city. The Bumba Popup Market is located next to the river, as you can see in the video. We visit Kelvert from ArteSana Panadería y Pastelería (ArteSana Bakery and Pastry/Cakery/Cake Shop) at least once and sometimes twice per week. His wife bakes fresh vegan bread with all natural ingredients and Kelvert sells it (and washes the dishes!). Kelvert also helps us with our Spanish and enjoys teaching us new words like “estaba haciendo ejercicio,” which means “I was exercising.” He sells bread on Tuesday and Thursday at a restaurant next to our gym so it’s super convenient to pick some up on my way home. 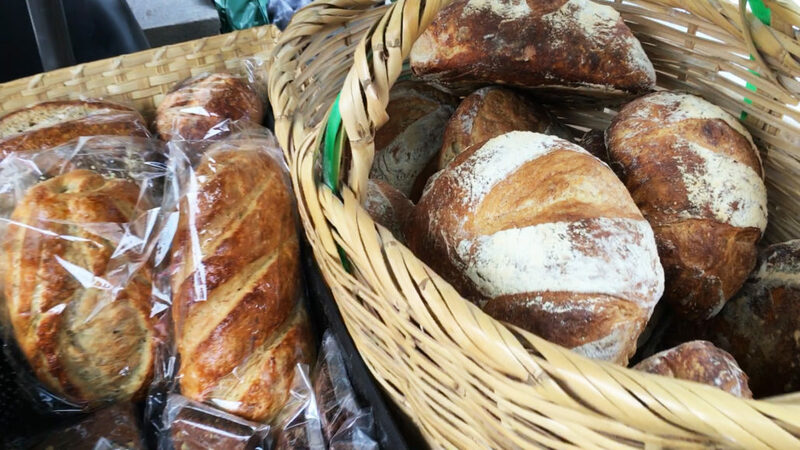 Our favorite bread from ArteSana is their sourdough. We have to ration ourselves or we can eat a whole loaf in a day! 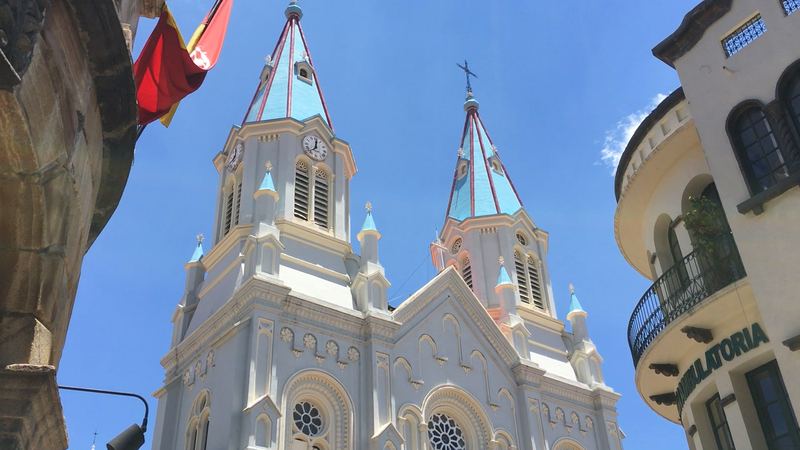 The New Cathedral of Cuenca is the largest cathedral in Ecuador and the blue domes help give Cuenca its amazing skyline. Even though this is referred to as the “new” cathedral, construction began in 1885. That’s over 130 years ago! But it’s still newer than the “old” cathedral (see below). We’ve visited Marisól before. She sells some very nice sweaters and scarves (bufandas) at the popup market that appears most weekends and holidays. The market has lots of different types of clothes, shoes, jewelry, toys and food. La Catedral Antigua de Cuenca or The Old Cathedral of Cuenca was built in 1557, making it over 460 years old. That’s more than 300 years older than the “new” cathedral (see above). It currently serves as a museum of religious art. I suppose we should venture inside someday, but that’s not really our cup of tea. We’ve seen some of Ecuador’s religious art, and it can be brutal and gory. The Spaniards used religion as a tool of fear and control after they invaded South America, which is reflected in the religious art of the time. Situated between The New Cathedral and The Old Cathedral, Parque Calderón is a beautiful city park and a popular destination for tourists and locals, alike. We’ll share more details about this park in a future video. 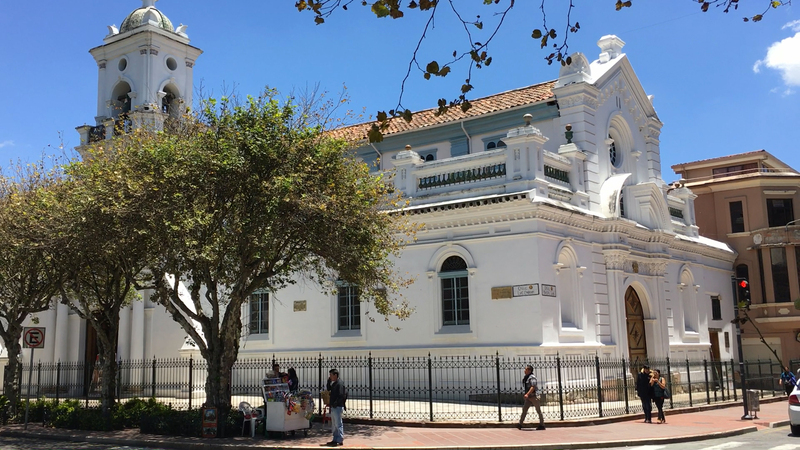 The original smaller La Iglesia de San Alfonso was completed in 1894, but the larger extension shown here was completed in 1911. The designer of the new extension was Huesgen Ziegelmeir, a German architect, which explains why this church looks like something you’d see in Germany rather than South America. 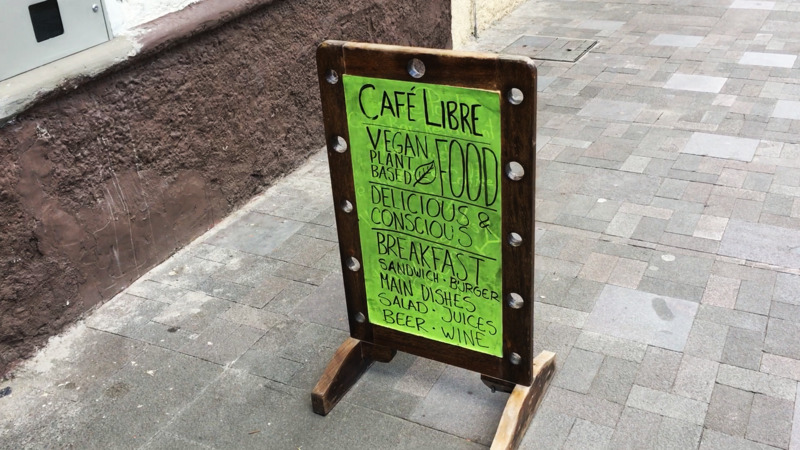 Café Libre is one of my favorite restaurants in Cuenca. It was also recently voted the “Best New Restaurant in Cuenca” by the popular Ecuadorian website, GringPost.com. 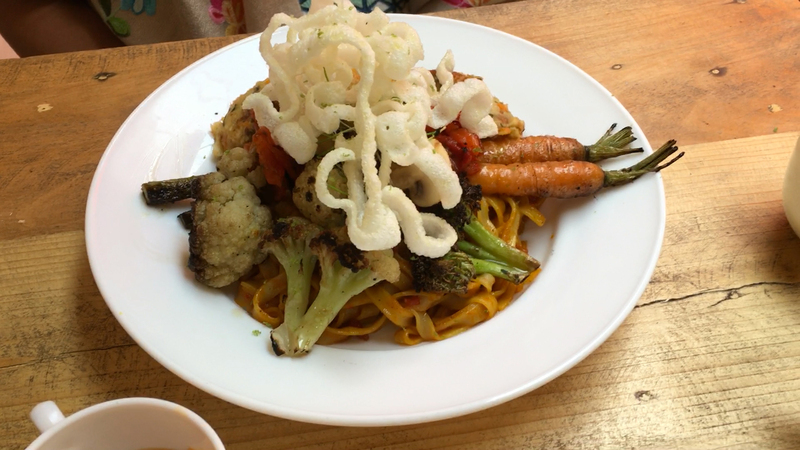 Considering it’s a plant-based restaurant without any meat on its menu, that says a lot about the quality of the food. Not only does it taste delicious, but the presentation is always pictureworthy. If you’re in Cuenca, you must try this restaurant and tell Paul, the co-owner, that Amelia and JP sent you. While you’re there, if it’s not too busy, ask Paul to tell you the story about how Café Libre came to be. It’s very interesting. This is one of my favorite dishes and I order it regularly. It’s BBQ Jackfruit that Paul sources from Guayaquil. 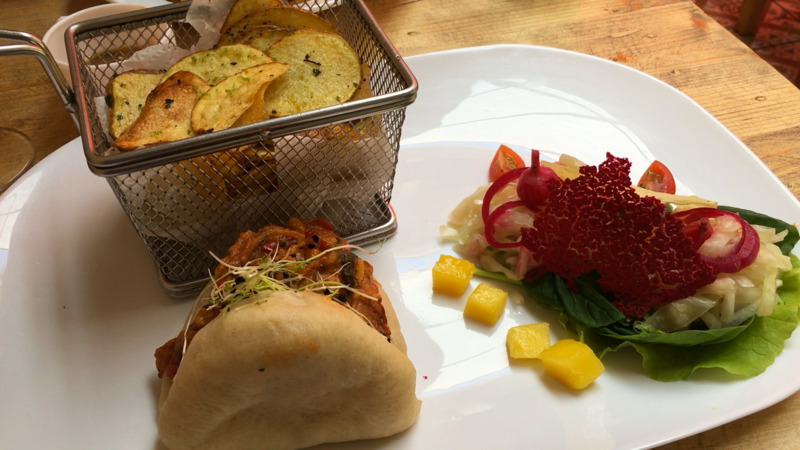 It’s served on a vegan Bao Bun, which is a type of bread that’s steamed instead of baked, making it very soft and doughy. It comes with a side salad and either housemade papas fritas (french fries) or chips (shown here). Amelia ordered this plato principal (main dish) for the first time today and she loved it. As the name implies, or rather, explicitly states, it’s a curry dish with tons of flavor and a variety of colors and textures. It was served with a side of fresh avocado topped with some rock salt and cracked pepper. Yum! 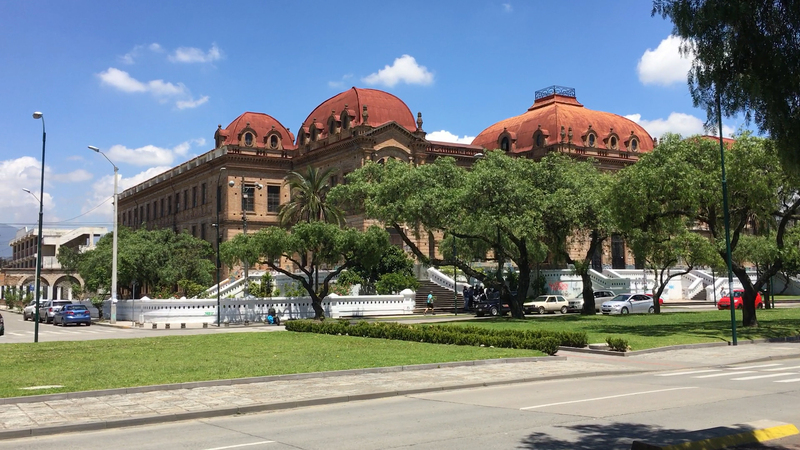 Parque de la Madre is one of the most popular parks in the city and it’s centrally located between the old El Centro and the newer part of the city to the south. 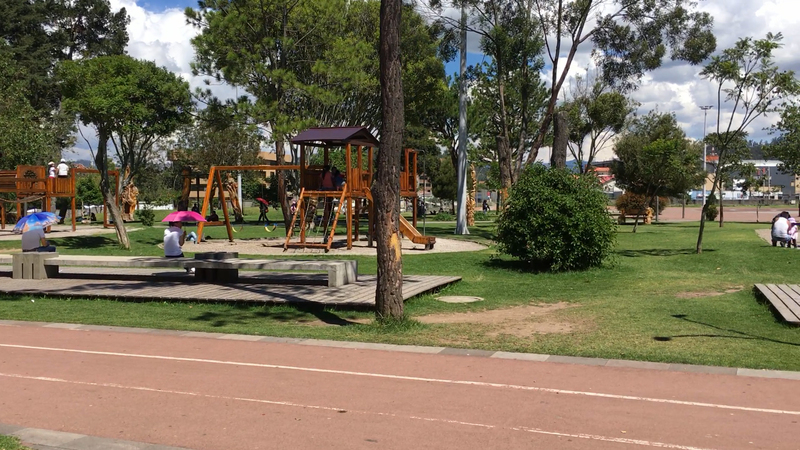 There are always lots of children playing (you can hear the soothing sounds in the video) and adults exercising, playing basketball, talking and relaxing. We’ve even seen running groups and concerts there. 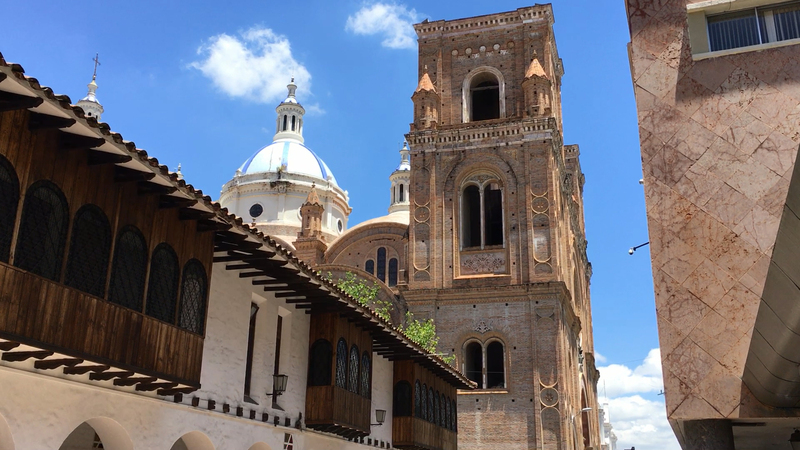 We hope you enjoyed our adventure through Cuenca, Ecuador today. Please remember to like, comment, share and subscribe to our YouTube channel. If you’d like us to make a video about something specific or if you have questions, please let us know in the comments. ¿Te gusta la bufanda? – Do you like the scarf? Sí, mucho. – Yes, a lot.